The Cleaning Show, one of Europe’s biggest trade events dedicated to commercial cleaning, has announced more details of next year’s show at London’s Excel. The three-day expo (19-21 March 2019) will once again feature suppliers, manufacturers, training organisations and trade organisations who are all involved in the cleaning, facilities management and waste management sectors. A number of major industry names have already signed up to attend the 2019 show. These include Diversey, the international cleaning and hygiene technology business which employs over 8,500 people globally. Diversey is returning to The Cleaning Show after a 10-year absence and has agreed to sponsor of the show’s VIP lounge. 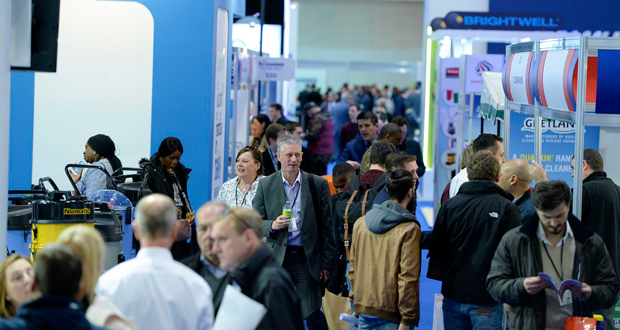 Other leading brands and businesses returning to The Cleaning Show include Kärcher, Vileda, Northwood Hygiene, Numatic, Makita, Evans Vanodine and Prochem. These will be joined by a number of new exhibitors, many of which are based overseas. Firms debuting will include one of the UK’s largest PPE distributors Arco, Italian storage and trolley retailer TTS, Chinese road and floor sweeper brush manufacturer Anhui Humanmei, Swedish flooring specialists Bona, and sustainable cleaning equipment supplier Greenspeed. Stan Atkins, Chair of the British Cleaning Council which co-produces The Cleaning Show, said: “The Cleaning Show is going from strength to strength and continues to grow. It is attracting new international exhibitors and also welcoming back several major brands which have been absent for some time. Deborah Bland, Senior Sector Marketing Manager at Diversey, said: “Diversey is delighted to be exhibiting at the Cleaning Show in 2019. We have not exhibited at a major FM, cleaning and hygiene show in the UK for a number of years. We feel now is the right time for us to be showing our complete range of products, systems and expertise. Michel de Bruin, Greenspeed’s CEO, said: “The UK’s commercial cleaning sector is increasingly embracing ‘green’ equipment and chemicals in response to both changing customer demands and legal compliance. “As one of the world’s most sustainable professional cleaning brands it therefore makes sense for us to bring the Greenspeed name, and our range of innovative and eco-friendly products, to The Cleaning Show next year. To reflect the increasingly global nature of The Cleaning Show there are also plans to invite more international competitors to attempt the World Record Window Cleaning Challenge. The Window Cleaning Challenge, which is adjudicated by the Federation of Window Cleaners on behalf of The Guinness Book of Records, has been dominated for over 20 years by Romford’s Terry ‘Turbo’ Burrows. In 2009 Terry broke his own fastest time by cleaning three 1.143m windows in just 9.14 seconds and, despite hundreds of challengers over the years, no-one has ever come close to beating it. Cleaning Show organisers now believe that the only way that Terry can be realistically challenged is to encourage competitors from other countries to travel to the UK and take a crack at his title. Another new development is the addition of a second trade exhibition to run parallel to The Cleaning Show. Called The Resource Management Show, the event will be a platform for recycling and waste management equipment manufacturers and distributors, product suppliers, and other related service providers, to promote their latest offerings. The Resource Management Show will also create a networking opportunity for thousands of decision makers from both the public and private sectors who are involved in FM, waste management, utilities, recycling and environmental health.